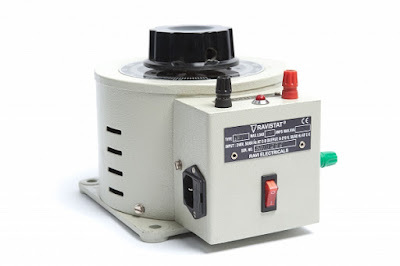 An auto transformer is a electrical transformer having only single winding which acts as both primary and secondary,so in input and output connected to shared single winding. Why we need to go for Auto Transformer ? We have some advantages of auto-transformer over normal two winding transformer. 1.Auto transformers usually smaller in size,because one winding is eliminated. 3.as the winding is same so leakage reactance will be less. In Auto Transformer, one single winding is shared as primary winding as well as secondary winding.as in transformer copper wire wound on silicon steel.as shown in the figure input connected at fixed positions.but on other side we employ some tapping to get variable output voltages.Variable turns ratio at secondary can be obtained by changing the tappings of the winding. If we compare conventional two winding transformer and auto transformer the amount of copper needed for auto transformer is less.weight of copper of any winding depends upon its length and cross - sectional area.and length depends on no.of turns,cross - sectional area varies with rated current. (i) current transformers and (ii) potential transformers. The large alternating currents which can not be sensed or passed through normal ammeters and current coils of watt meters, energy meters can easily be measured by use of current transformers along with normal low range instruments. A transformer is a device which consists of two winding's called primary and secondary. It transfers energy from one side to another with suitable change in the level of current or voltage. A current transformer basically has a primary coil of one or more turns of heavy cross-sectional area. In some, the bar carrying high current may act as a primary. This is connected in series with the line carrying high current. The secondary of the transformer is made up of a large number of turns of fine wire having small cross-sectional area. This is usually rated for 5 A. This is connected to the coil of normal range ammeter. Through this ammeter we can note down the value of current flowing through the secondary winding of current transformer. 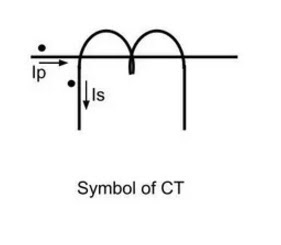 Symbolic representation of a current transformer is as shown in the figure. A combination of current transformer and ammeter helps us to find out the higher values of current flowing through line. As discussed we step down the value of line current by increasing the turns in secondary winding. This shows that there is inverse relation between between primary and secondary current and the number of turns of primary and secondary. 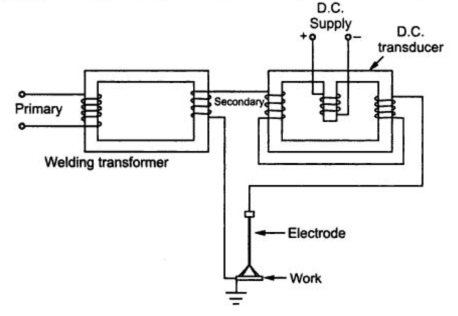 We connect an ammeter to the secondary winding of current transformer to get secondary current which is shown in the following figure. So now we can calculate the value of current through line or primary current from the C.T ratio. Np is number turns of primary winding. Ns is number turns of secondary winding. Ip is current through primary winding. Is is current through secondary winding. The large alternating currents which can not be sensed or passed through normal voltmeters and voltage coils of watt meters, energy meters can easily be measured by use of potential transformers along with normal low range instruments. A potential transformer has two winding's namely primary and secondary. Primary winding has large number of turns and it is connected in parallel to the line(between line and ground) whose voltage is to be measured. Now the secondary has less number of turns. This is usually rated to 110 V and is connected directly to voltmeter. Through this voltmeter we can note down the value of voltage across the secondary winding of potential transformer.Symbolic representation of a potential transformer is as shown in the figure. A combination of potential transformer and voltmeter helps us to find out the higher values of potential across the line. As discussed we step down the value of primary voltage by decreasing the turns in secondary winding. This shows that primary and secondary voltage and the number of turns of primary and secondary are directly proportional.We connect an voltmeter across the secondary winding of potential transformer to get secondary voltage which is shown in the following figure. In this post we have learnt about instrument transformers namely current transformer and potential transformer. Now a days we have many ac power supplies. So the usage of welding transformer has significant role in welding compared to a motor generator set. When we need to use a motor generator set for welding we need to run it continuously which produces a lot of noise. With the help of welding transformer weld is done with a less noise. Now let us see in detail about welding transformer. 1. Welding transformer is a step down transformer. 2. It has a magnetic core with primary winding which is thin and has large number of turns on one arm. 3. A secondary winding with less number of turns and high cross-sectional area on the other arm. 4. Due to this type of windings in primary and secondary it behaves as step down transformer. 5. So we get less voltage and high current from the secondary winding output. This is the construction of ac welding transformer. 6.A dc welding transformer also has same type of winding the only difference is that we connect a rectifier(which converts ac to dc) at the secondary to get dc output. 7.We also connect a inductor or filter to smooth the dc current. This will be construction of dc welding transformer. The diagrams are shown below. Many people have a doubt which is primary winding and which is secondary winding. The winding which is connected to power supply is called primary winding and the winding to which load is connected is called secondary winding. 1.As it is a step down transformer we have less voltage at secondary which is nearly 15 to 45 volts and has high current values which is nearly 200 A to 600 A it can also be higher than this value. 2. For adjusting the voltage on secondary side there are tappings on secondary winding by this we can get required amount of secondary current for welding. 3. These tappings are connected to several high current switches. 4. Now one end of secondary winding is connected to the welding electrode and the other end is connected to the welding pieces as shown in fig 2. 5.When a high current flows a large amount of I2R heat is produced due to contact resistance between welding pieces and electrode. 6.Because of this high heat the tip of electrode melts and fills the gap between the welding pieces. This is how a welding transformer works. 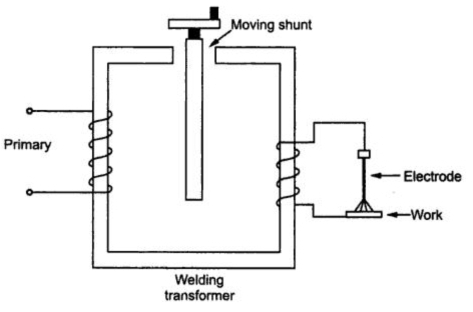 Figure given below shows the volt - ampere characteristics of welding transformer. The impedance of welding transformer must be higher than the normal transformer to control arc and also to control current. Now let us see each of this methods for arc control of welding transformer in detail. 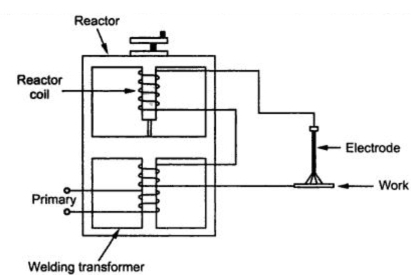 Below is the circuit for arc control using tapped reactor is given below. With the help of taps we control the current. It has limited current control. Below is the circuit for arc control using moving coil reactor. The distance between primary and secondary decides the amount of current. If the distance between the primary and secondary is high then the current is less. Below is the circuit for arc control using magnetic shunt reactor. By adjusting the central magnetic shunt flux is changed. By changing the flux current can be changed. Below is the circuit for arc control using continuously variable reactor. By varying the height of reactor core insertion is changed. If core insertion is greater reactance is higher so output current will be less. Below is the circuit for arc control using saturable reactor. The reactance of the reactor in this is adjusted by changing the value of d.c. excitation which is obtained from d.c. controlled transducer. Higher the d.c. currents, reactor approaches to saturation. This changes the reactance of reactor. By changing the reactance current can be changed. By using above reactors current can be controlled which helps to control the arc. In this post we have learnt about welding transformers. To download this post on welding transformers as PDF click here. In this post we are going to discuss about Voltage regulation of a transformer. What is meant my Voltage regulation of transformer? Voltage regulation of a transformer may be defined as the difference between no load voltage of the secondary terminal of a transformer and full load voltage of the secondary terminal of that transformer at a certain power factor. Voltage regulation of a transformer is expressed in percentage of either no load secondary terminal voltage or full load secondary terminal voltage. Calculating voltage regulation of transformer gives how much efficiently the transformer is resisting the voltage changes from no load to full load. If there is no change in value of secondary voltage from no load to full load then the transformer is ideal and has voltage regulation 0%. So the lower the value of voltage regulation the higher is the performance of the transformer. Consider a transformer which is at no load which means the secondary of the transformer is open circuited. In this case the secondary voltage of the transformer and induced emf are same let it be E2 . Now full load is connected to the secondary of a transformer. In this case current I2 passes in the secondary which will lead to voltage drop and is given by I2Z2. Where Z2 is called secondary impedance of transformer. During this situation primary winding will draw equivalent full load current. Because of the voltage drop the secondary voltage cannot be E2 anymore so secondary induced emf will be V2. Voltage regulation % = (E2-V2/V2)×100%. This is called regulation down. Power factor is specific. Now lets derive the expression for calculating voltage regulation of transformer for lagging power factor. Angle between OC and OD is very less so OC is approximately equal to OD. E2 = OC = OA + AB + BC. Voltage regulation%=( I2R2cos𝚹2+ I2R2sin𝚹2/ V2 ) ×100%. Now lets derive the expression for calculating voltage regulation of transformer for leading power factor. E2 = OC = OA +AB - BC. Voltage regulation%=(I2 R2cos𝚹2 - I2R2sin𝚹2 /V2 ) ×100%. Thus we have learnt what is voltage regulation of transformer and derived expressions for voltage regulation of transformer for lagging and leading power factors. You can download this article of Voltage Regulation OF Transformer as a PDF here. In our previous articles we have discussed transformer working,construction etc.Today we discuss one of the important parameter of distribution transformer I.e, "all day efficiency of a distribution transformer".We know for a transformer, the efficiency is defined as the ratio of output power to input power. The above equation is efficiency of any transformer. But for some special types of transformers such as distribution transformers power efficiency is not the true measure of the performance.For that purpose distribution transformer we calculate all day efficiency.Distribution transformer serve residential and commercial loads. The load on distribution transformers vary considerably during the period of the day. For most period of the day these transformers are working at 30 to 40 % of full load only or even less than that. But the primary of such transformers is energised at its rated voltage for 24 hours, to provide continuous supply to the consumer. The core loss which depends on voltage, takes place continuously for all the loads. But copper loss depends on the load condition. For no load, copper loss is negligibly small while on full load it is at its rated value. Hence power efficiency can not give the measure of true efficiency of distribution transformers. in such transformers, the energy output is calculated in kilo watt hour (kWh). Then ratio of total energy output to total energy input (output + losses) is calculated. Such ratio is called energy efficiency or All Day Efficiency of a transformer. While calculating energies, all energies can be expressed in watt hour (Wh) instead of kilo watt hour (kWh). Such distribution transformers are designed to have very low core losses. This is achieved by limiting the core flux density to lower value by using a relative higher core cross-section i.e. larger iron to copper weight ratio. The maximum efficiency in distribution transformers occurs at about 60-70 % of the full load. So by proper designing, high energy efficiencies can be achieved for distribution transformers. 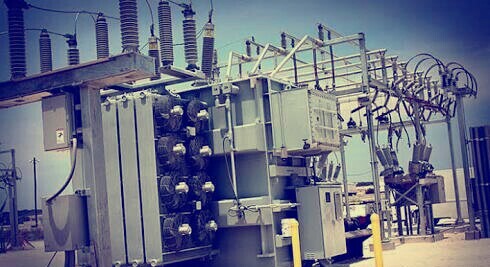 Numerical problems on all day efficiency of a transformer will be posted soon. 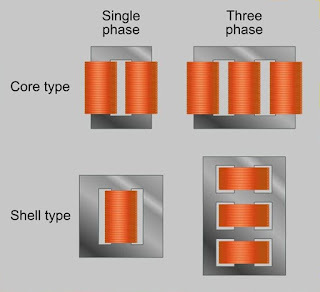 In our previous articles we have discusses about differences between lap,wave winding this tutorial we are sharing major differences between core type transformer and shell type transformer. In this tutorial comparisons between shell type and core type transformers are discussed.There are two major types of transformers based on construction. of the core.It is installed on mid-limb of the core. 2. Core type transformers have only one magnetic flux path. 2. 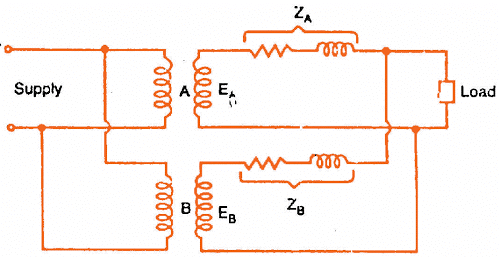 Shell type transformers have two magnetic flux path. 4. It is very useful when we need large size low voltage. 4. It is very useful when we need small size high voltage. 5. In core type transformer output is less. Because of losses. less losses.So efficiency will be more. 7. It has less mechanical protection to coil. 7. It has better mechanical protection to coil. 8. Core has two limbs. 8. Core has three limbs. skilled technician to maintain this type of transformer. winding are used 10. In this type transformer sandwiched winding are used. The transformers are connected in parallel when the load on them is more than the rating of the individual transformers. Before going to discuss about parallel operation of single phase transformers A small question for you all that is 'why parallel operation of transformers is required? '.Answer is simple we have some advantages over operating single transformer units so we go for parallel operation of transformers. Parallel operation is nothing but connecting primary windings of two or more transformers to supply and secondary windings to common loads.To supply more than the rating of existing transformer parallel connections will be employed.It is very economical to operate small no.of transformer units in parallel to supply rated output than a big rated transformer. Maximum power system efficiency: Power system loads always varies to maintain its efficiency we operate transformers in parallel because transformer gives the maximum efficiency at full load,if we use single large transformer,load on the large transformer always varies so it will operate with low efficiency. In other hand if we operate small units in parallel we can switch on/off as per load demand and we can maintain high efficiency. Ease of electrical power switching: Scheduling the power with single large transformer will become difficult because of it's high rating and distribution system will be connected ,controlled by a single transformer we can avoid this problem using parallel operation of transformers.This also improves power system reliability,flexibility. Economical Issues /Non-availability of large transformer: If a large transformer of required rating is unavailable we can go for small rated transformers which can perform better than single large unit. And large transformer operating costs will be more than parallel operation of single phase transformers. Easier transportation: Transportation will be very easy for small transformers: If installation location is far away from transformer manufacturing/selling point.So parallel operation of transformers is to be encouraged. 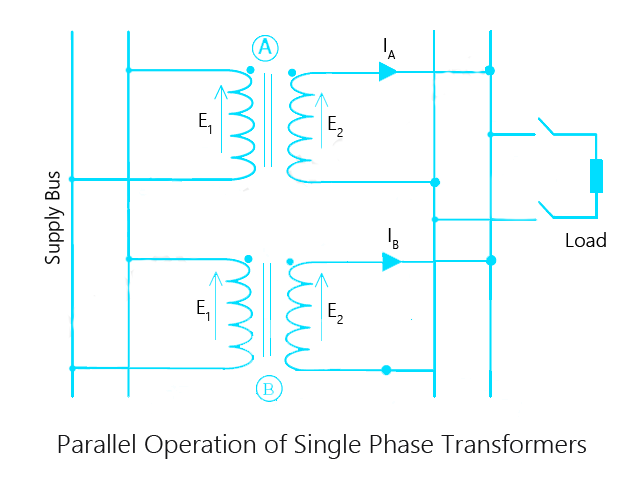 We can't connect any two or more transformers in parallel blindly.When two or more transformers need to operate in parallel, they must met some conditions for efficient performance.Major conditions for parallel operation of transformers are listed below. The voltage ratings and voltage ratios of the transformers should be the same. Transformers should be properly connected with regard to their polarities. The per unit or percentage impedance of the transformers should be equal. The reactance/resistance ratios of the transformers should be the same. 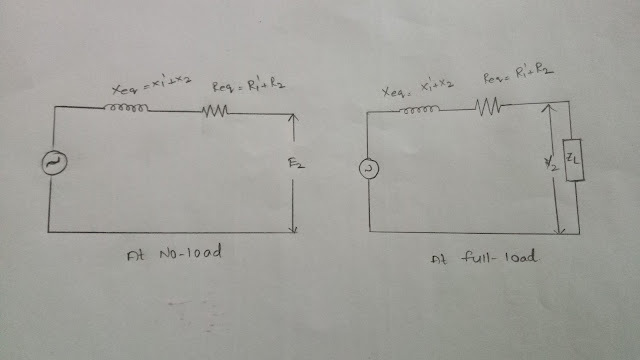 The voltage ratios of two transformers must be same but why? Reason is simple if voltage ratio of two transformers is different and they put in parallel with same primary supply voltage, there will be a difference in secondary voltages. As secondaries of transformers completes a closed loop there will be circulating currents.In this case, considerable amount of current is drawn by the transformers even without load.As the internal impedance of transformer is small, a small voltage difference may cause sufficiently high circulating current causing unnecessary extra I²R loss. Polarity of all connected transformers must be same in order to avoid short circuit.Polarity of a transformer taken w.r.t dot notation.Dots of all transformers connected together on primary and secondary separately. 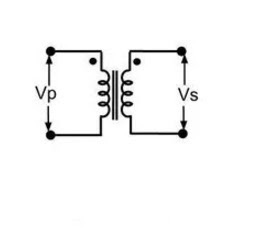 If polarity is opposite to each other, huge circulating current flows.In the below diagram right and wrong parallel operation connections are shown take a look. 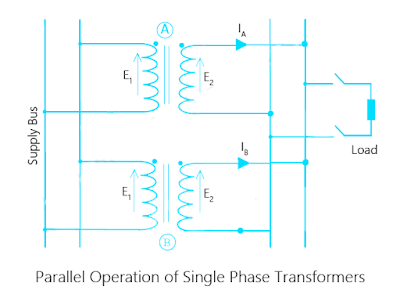 The phase sequence must be identical of all parallel transformers. This condition is can be applied only to poly-phase transformers. If the phase sequences are not same, then transformers can not be connected in parallel.During the cycle, each pair of phases will be short circuited. The per unit (pu) impedance of each transformer on its own base must be same.This condition is also desirable for proper parallel operation of single phase transformers. If this condition is not met, the transformers will not share the load according to their kVA ratings. Sometimes this condition is not fulfilled by the design of the transformers. In that case, it can be corrected by inserting proper amount of resistance or reactance or both in series with either primary or secondary circuits of the transformers where the impedance is below the value required to fulfill this condition.That is why per unit impedance of the connected transformers must be same. We conduct open circuit and short circuit test on single phase transformer to determine the efficiency and regulation of a transformer on any load condition and at any power factor.Open circuit & short circuit test are also called as OC test & SC test on transformer.This method of finding the parameters of a transformer is called as an indirect loading method. What is the need of OC & SC test on transformers? Open circuit test and short circuit test on transformer are very economical and convenient because they are performed without actually loading of the transformer.because they furnish the required information without actually loading the transformer. In fact, the testing of very large a.c. machinery consists of running two tests similar to the open and short-circuit tests of a transformer. The circuit diagram for open circuit test is shown in the figure. A voltmeter(V), wattmeter(W), and an ammeter(A) are connected in LV side of the transformer.Usually high voltage (HV) winding is kept open and the low voltage (LV) winding is connected to its normal supply.Because we are going to find the max output voltage of transformer which is present at HV side.This is the reason why HV winding is open circuited. Switch on single phase AC supply,with the help of variac,increase the voltage until the voltmeter raeds the rated voltage of the LV side. At the instant of rated LV voltage, Note down the readings of all three instruments. (Voltmeter, Ammeter and Wattmeter readings) are recorded. The ammeter reading gives the no load current I0.As no load current (I0) very small,voltage drop due to this current also neglected.The input power supplied to the transformer is indicated by the watt meter (W).Output power of transformer in open circuit test is zero because other side of transformer is open circuited.That means input supply is to just compensate the core losses and copper losses.By neglecting some voltage drop due to small no-load current,Watt meter (W) reading gives the core losses of the transformer. where, X0,R0 are equivalent exciting reactance,resistance of transformer. 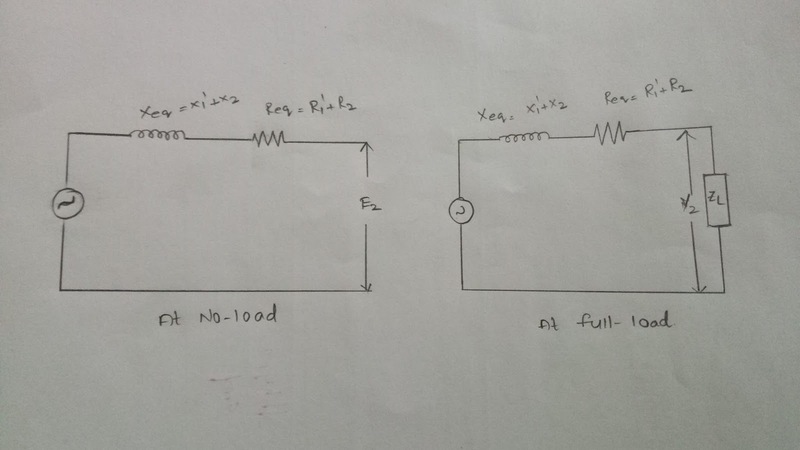 Key Point : We should use LPF (low power factor)watt meter to get error free results.Beacuse cos Φo is very low in the above case.The above values are calculated by taking LV side of transformer as reference.If the meters are connected on secondary and primary is kept open then from O.C. test we get Ro' and Xo' with which we can obtain Ro and Xo knowing the transformation ratio K.
The equivalent circuit derived by the OC test is shown below. Hence,we can conclude that open circuit test on transformer gives gives core losses of transformer and shunt parameters of the equivalent circuit. The connection diagram for short circuit test on transformer is shown in the figure. A voltmeter(V), wattmeter(W), and an ammeter(A) are connected in HV side of the transformer as shown.The secondary winding is short circuited with the help of thick copper wire or solid link. As high voltage side is always low current side, it is convenient to connect high voltage side to supply and shorting the low voltage side. Apply voltage to HV side. Increase the voltage from the zero until the ammeter reading equals the rated current. At the instant of rated HV current, Note down the readings of all three instruments. (Voltmeter, Ammeter and wattmeter readings) are recorded. Now the current flowing through the windings of transformer is rated current. Hence the total copper loss will be full load copper loss.Iron losses are neglected due to small fraction of voltage supllied. Hence the wattmeter reading shows the power loss which is equal to full load copper losses as iron losses are neglected. Thus we get the equivalent circuit parameters R1e, X1e and Z1e. Knowing the transformation ratio K, the equivalent circuit parameters referred to secondary also can be obtained. In the above efficiency equation, the core or iron losses and full load copper losses are found by OC and SC tests. The above two equations are used based on the parameters are referred to primary or secondary sides. Hence, from the SC test data we can find out the regulation of a transformer. The positive sign is used for lagging power factor and negative sign is used for leading power factor.